Give your passengers the safety and security of Mopar Jeep grab handles from JustforJeeps.com. These Jeep Wrangler grab handles feature a non-slip grip, and their nylon straps feature embroidered Jeep logos. Simply attach these handles to your vehicle's sport bars and you're ready to go. Keep in mind that these Mopar grab handles don't include a coat hook; they're just designed to give your passengers an anchor point within your vehicle. 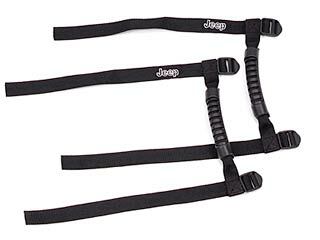 Pair of Grab Handles with molded handles and embroidered "Jeep" logos on nylon straps that attach to the sport bar. Does NOT include Coat Hook. For just the grab handle and coat hook please click here. Great product. Just what I expected. Very easy to install, would fit any jeep. No worries about nuts & bolts. Install was easy. Work great. Just what we wanted. The handles are sturdy and easy to install. I have freedom tops, and by removing them the installation of the handles is a breeze. It's a Xmas gift. They look good. Bought these so that wife and kids could get into jeep easier; they do the job, easy to install, have Jeep brand on them, also helps to have something to grab onto when off road in particular. Easy to install. Comfortable. Looks good. Great price. Exactly as advertised. A nice utilitarian addition to my jeep! Easy to install. It helps my wife to get in easier. Installation is quick and say and they work great! I ordered these as I've tired other brands, but these are by far the best looking handles. They take a little work to tighten up but that was not a big deal. Yu won't be sorry as these are sleek looking and add that nice touch to the interior. get in and out with out any trouble. Good product. Very good quality, easy to install and looks nice.